Climate engineering, commonly referred to as geoengineering, also known as climate intervention, is the deliberate and large-scale intervention in the Earth’s climatic system with the aim of limiting adverse climate change. Climate engineering is an umbrella term for two types of measures: carbon dioxide removal and solar radiation management. Carbon dioxide removal addresses the cause of climate change by removing one of the greenhouse gases (carbon dioxide) from the atmosphere. Solar radiation management attempts to offset effects of greenhouse gases by causing the Earth to absorb less solar radiation. Climate engineering approaches are sometimes viewed as additional potential options for limiting climate change, alongside mitigation and adaptation. There is substantial agreement among scientists that climate engineering cannot substitute for climate change mitigation. Some approaches might be used as accompanying measures to sharp cuts in greenhouse gas emissions. Given that all types of measures for addressing climate change have economic, political, or physical limitations as some climate engineering approaches might eventually be used as part of an ensemble of measures. Research on costs, benefits, and various types of risks of most climate engineering approaches is at an early stage and their understanding needs to improve to judge their adequacy and feasibility. No outdoor solar radiation management projects have taken place to date. Almost all research into solar radiation management has consisted of computer modelling or laboratory tests, and an attempt to move to outdoor experimentation was controversial. Some carbon dioxide removal practices, such as planting of trees and bio-energy with carbon capture and storage projects, are underway. Their scalability to effectively affect global climate is however debated. Ocean iron fertilization has been given small-scale research trials, sparking substantial controversy. With respect to climate, geoengineering is defined by the Royal Society as "... the deliberate large-scale intervention in the Earth’s climate system, in order to moderate global warming." Several organizations have investigated climate engineering with a view to evaluating its potential, including the US Congress, the National Academy of Sciences, the Royal Society, and the UK Parliament. The Asilomar International Conference on Climate Intervention Technologies was convened to identify and develop risk reduction guidelines for climate intervention experimentation. Some environmental organisations (such as Friends of the Earth and Greenpeace) have been reluctant to endorse solar radiation management, but are often more supportive of some carbon dioxide removal projects, such as afforestation and peatland restoration. Some authors have argued that any public support for climate engineering may weaken the fragile political consensus to reduce greenhouse gas emissions. Several climate engineering strategies have been proposed. IPCC documents detail several notable proposals. These fall into two main categories: solar radiation management and carbon dioxide removal. Here is a list of specific proposals. Solar radiation management (SRM) techniques would seek to reduce sunlight absorbed (ultra-violet, near infra-red and visible). This would be achieved by deflecting sunlight away from the Earth, or by increasing the reflectivity (albedo) of the atmosphere or the Earth's surface. These methods would not reduce greenhouse gas concentrations in the atmosphere, and thus would not seek to address problems such as the ocean acidification caused by CO2. In general, solar radiation management projects presently appear to be able to take effect rapidly and to have very low direct implementation costs relative to greenhouse gas emissions cuts and carbon dioxide removal. Furthermore, many proposed SRM methods would be reversible in their direct climatic effects. While greenhouse gas remediation offers a more comprehensive possible solution to climate change, it does not give instantaneous results; for that, solar radiation management is required. Surface-based: for example, using pale-colored roofing materials, attempting to change the oceans' brightness, or growing high-albedo crops. Troposphere-based: for example, marine cloud brightening, which would spray fine sea water to whiten clouds and thus increase cloud reflectivity. Upper atmosphere-based: creating reflective aerosols, such as stratospheric sulfate aerosols, specifically designed self-levitating aerosols, or other substances. Space-based: space sunshade—obstructing solar radiation with space-based mirrors, dust, etc. 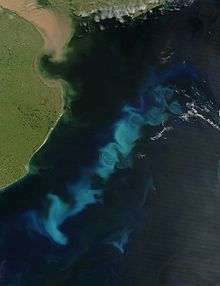 An oceanic phytoplankton bloom in the South Atlantic Ocean, off the coast of Argentina. The aim of ocean iron fertilization in theory is to increase such blooms by adding some iron, which would then draw carbon from the atmosphere and fix it on the seabed. Climate change during the last 65 million years. The Paleocene–Eocene Thermal Maximum is labelled PETM. It is argued that climate change may cross tipping points where elements of the climate system may 'tip' from one stable state to another stable state, much like a glass tipping over. When the new state is reached, further warming may be caused by positive feedback effects,. 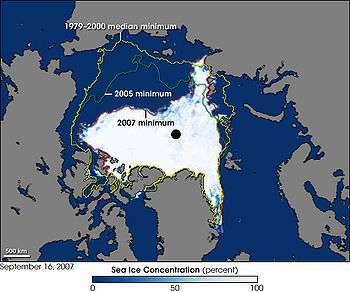 An example of a proposed causal chain leading to runaway global warming is the collapse of Arctic sea ice triggering subsequent release of methane. Such a scenario, however, is regarded as unlikely by many scientists. The precise identity of such "tipping points" is not clear, with scientists taking differing views on whether specific systems are capable of "tipping" and the point at which this "tipping" will occur. 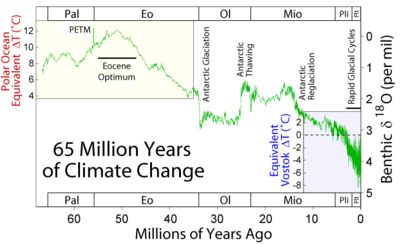 An example of a previous tipping point is that which preceded the rapid warming leading up to the Paleocene–Eocene Thermal Maximum. Once a tipping point is crossed, cuts in anthropogenic greenhouse gas emissions will not be able to reverse the change. Conservation of resources and reduction of greenhouse emissions, used in conjunction with climate engineering, are therefore considered a viable option by some commentators. Climate engineering offers the hope of temporarily reversing some aspects of climate change and allowing the natural climate to be substantially preserved whilst greenhouse gas emissions are brought under control and removed from the atmosphere by natural or artificial processes. Estimates of direct costs for climate engineering implementation vary widely. In general, carbon dioxide removal methods are more expensive than the solar radiation management ones. In their 2009 report Geoengineering the Climate the Royal Society judged afforestation and stratospheric aerosol injection as the methods with the "highest affordability" (lowest costs). More recently, research into costs of solar radiation management have been published. This suggests that "well designed systems" might be available for costs in the order of a few hundred million to tens of billions of dollars per year. These are much lower than costs to achieve comprehensive reductions in CO2 emissions. Such costs would be within the budget of most nations, and even some wealthy individuals. Climate engineering would represent a large-scale, intentional effort to modify the climate. It would differ from activities such as burning fossil fuels, as they change the climate inadvertently. Intentional climate change is often viewed differently from a moral standpoint. It raises questions of whether humans have the right to change the climate deliberately, and under what conditions. For example, there may be an ethical distinction between climate engineering to minimize anthropogenic climate change and doing so to optimize the climate. Furthermore, ethical arguments often confront larger considerations of worldview, including individual and social religious commitments. This may imply that discussions of climate engineering should reflect on how religious commitments might influence the discourse. For many people, religious beliefs are pivotal in defining the role of human beings in the wider world. Some religious communities might claim that humans have no responsibility in managing the climate, instead seeing such world systems as the exclusive domain of a Creator. In contrast, other religious communities might see the human role as one of "stewardship" or benevolent management of the world. The question of ethics also relates to issues of policy decision-making. For example, the selection of a globally agreed target temperature is a significant problem in any climate engineering governance regime, as different countries or interest groups may seek different global temperatures. It has been argued that regardless of the economic, scientific and technical aspects, the difficulty of achieving concerted political action on climate change requires other approaches. Those arguing political expediency say the difficulty of achieving meaningful emissions cuts and the effective failure of the Kyoto Protocol demonstrate the practical difficulties of achieving carbon dioxide emissions reduction by the agreement of the international community. However, others point to support for climate engineering proposals among think tanks with a history of climate change skepticism and opposition to emissions reductions as evidence that the prospect of climate engineering is itself already politicized and being promoted as part of an argument against the need for (and viability of) emissions reductions; that, rather than climate engineering being a solution to the difficulties of emissions reductions, the prospect of climate engineering is being used as part of an argument to stall emissions reductions in the first place. 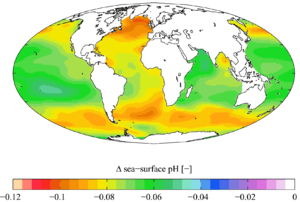 Change in sea surface pH caused by anthropogenic CO2 between the 1700s and the 1990s. This ocean acidification will still be a major problem unless atmospheric CO2 is reduced. Various criticisms have been made of climate engineering, particularly solar radiation management (SRM) methods. Decision making suffers from intransitivity of policy choice. Some commentators appear fundamentally opposed. Groups such as ETC Group and individuals such as Raymond Pierrehumbert have called for a moratorium on climate engineering techniques. The effectiveness of the techniques proposed may fall short of predictions. In ocean iron fertilization, for example, the amount of carbon dioxide removed from the atmosphere may be much lower than predicted, as carbon taken up by plankton may be released back into the atmosphere from dead plankton, rather than being carried to the bottom of the sea and sequestered. The existence of such techniques may reduce the political and social impetus to reduce carbon emissions. This has generally been called a potential moral hazard, although risk compensation may be a more accurate term. This concern causes many environmental groups and campaigners to be reluctant to advocate or discuss climate engineering for fear of reducing the imperative to cut greenhouse gas emissions. However, several public opinion surveys and focus groups have found evidence of either assertions of a desire to increase emission cuts in the face of climate engineering, or of no effect. Other modelling work suggests that the threat of climate engineering may in fact increase the likelihood of emissions reduction. Climate engineering opens up various political and economic issues. The governance issues characterizing carbon dioxide removal compared to solar radiation management tend to be distinct. Carbon dioxide removal techniques are typically slow to act, expensive, and entail risks that are relatively familiar, such as the risk of carbon dioxide leakage from underground storage formations. In contrast, solar radiation management methods are fast-acting, comparatively cheap, and involve novel and more significant risks such as regional climate disruptions. As a result of these differing characteristics, the key governance problem for carbon dioxide removal (as with emissions reductions) is making sure actors do enough of it (the so-called "free rider problem"), whereas the key governance issue for solar radiation management is making sure actors do not do too much (the "free driver" problem). These principles have been endorsed by the House of Commons of the United Kingdom Science and Technology Select Committee on “The Regulation of Geoengineering”, and have been referred to by authors discussing the issue of governance. The Asilomar conference was replicated to deal with the issue of climate engineering governance, and covered in a TV documentary, broadcast in Canada. There is general consensus that no climate engineering technique is currently sufficiently safe or effective to greatly reduce climate change risks, for the reasons listed above. However, some may be able to contribute to reducing climate risks within relatively short times. All proposed solar radiation management techniques require implementation on a relatively large scale, in order to impact the Earth's climate. The least costly proposals are budgeted at tens of billions of US dollars annually. Space sunshades would cost far more. Who was to bear the substantial costs of some climate engineering techniques may be hard to agree. However, the more effective solar radiation management proposals currently appear to have low enough direct implementation costs that it would be in the interests of several single countries to implement them unilaterally. In contrast, carbon dioxide removal, like greenhouse gas emissions reductions, have impacts proportional to their scale. These techniques would not be "implemented" in the same sense as solar radiation management ones.The problem structure of carbon dioxide removal resembles that of emissions cuts, in that both are somewhat expensive public goods, whose provision presents a collective action problem. Before they are ready to be used, most techniques would require technical development processes that are not yet in place. As a result, many promising proposed climate engineering do not yet have the engineering development or experimental evidence to determine their feasibility or efficacy. Most of what is known about the suggested techniques is based on laboratory experiments, observations of natural phenomena, and on computer modelling techniques. Some proposed climate engineering methods employ methods that have analogues in natural phenomena such as stratospheric sulfur aerosols and cloud condensation nuclei. As such, studies about the efficacy of these methods can draw on information already available from other research, such as that following the 1991 eruption of Mount Pinatubo. However, comparative evaluation of the relative merits of each technology is complicated, especially given modelling uncertainties and the early stage of engineering development of many proposed climate engineering methods . Reports into climate engineering have also been published in the United Kingdom by the Institution of Mechanical Engineers and the Royal Society. The IMechE report examined a small subset of proposed methods (air capture, urban albedo and algal-based CO2 capture techniques), and its main conclusions were that climate engineering should be researched and trialled at the small scale alongside a wider decarbonisation of the economy. The Royal Society review examined a wide range of proposed climate engineering methods and evaluated them in terms of effectiveness, affordability, timeliness and safety (assigning qualitative estimates in each assessment). The report divided proposed methods into "carbon dioxide removal" (CDR) and "solar radiation management" (SRM) approaches that respectively address longwave and shortwave radiation. The key recommendations of the report were that "Parties to the UNFCCC should make increased efforts towards mitigating and adapting to climate change, and in particular to agreeing to global emissions reductions", and that "[nothing] now known about climate engineering options gives any reason to diminish these efforts". Nonetheless, the report also recommended that "research and development of climate engineering options should be undertaken to investigate whether low risk methods can be made available if it becomes necessary to reduce the rate of warming this century". In a 2009 review study, Lenton and Vaughan evaluated a range of proposed climate engineering techniques from those that sequester CO2 from the atmosphere and decrease longwave radiation trapping, to those that decrease the Earth's receipt of shortwave radiation. In order to permit a comparison of disparate techniques, they used a common evaluation for each technique based on its effect on net radiative forcing. As such, the review examined the scientific plausibility of proposed methods rather than the practical considerations such as engineering feasibility or economic cost. Lenton and Vaughan found that "[air] capture and storage shows the greatest potential, combined with afforestation, reforestation and bio-char production", and noted that "other suggestions that have received considerable media attention, in particular "ocean pipes" appear to be ineffective". They concluded that "[climate] geoengineering is best considered as a potential complement to the mitigation of CO2 emissions, rather than as an alternative to it". In October 2011, a Bipartisan Policy Center panel issued a report urging immediate researching and testing in case "the climate system reaches a 'tipping point' and swift remedial action is required". The National Academy of Sciences conducted a 21-month project to study the potential impacts, benefits, and costs of two different types of climate engineering: carbon dioxide removal and albedo modification (solar radiation management). The differences between these two classes of climate engineering "led the committee to evaluate the two types of approaches separately in companion reports, a distinction it hopes carries over to future scientific and policy discussions." "Climate intervention is no substitute for reductions in carbon dioxide emissions and adaptation efforts aimed at reducing the negative consequences of climate change. However, as our planet enters a period of changing climate never before experienced in recorded human history, interest is growing in the potential for deliberate intervention in the climate system to counter climate change. ...Carbon dioxide removal strategies address a key driver of climate change, but research is needed to fully assess if any of these technologies could be appropriate for large-scale deployment. Albedo modification strategies could rapidly cool the planet’s surface but pose environmental and other risks that are not well understood and therefore should not be deployed at climate-altering scales; more research is needed to determine if albedo modification approaches could be viable in the future." The project was sponsored by the National Academy of Sciences, U.S. Intelligence Community, National Oceanic and Atmospheric Administration, NASA, and U.S. Department of Energy. Models suggest that if SRM methods were realizable they would be effective in countering increasing temperatures, and would be less, but still, effective in countering some other climate changes. SRM would not counter all effects of climate change, and all proposed geoengineering methods also carry risks and side effects. Additional consequences cannot yet be anticipated as the level of scientific understanding about both SRM and CDR is low. There are also many (political, ethical, and practical) issues involving geoengineering that are beyond the scope of this report. ↑ "Public Release Event: Climate Intervention Reports; Climate Intervention: Carbon Dioxide Removal and Reliable Sequestration and Climate Intervention: Reflecting Sunlight to Cool Earth". nas-sites.org/americasclimatechoices. National Academy of Sciences. Retrieved September 21, 2016. ↑ United States Government Accountability Office (GAO) (July 2011). Climate Engineering: Technical Status, Future Directions, and Potential Responses (PDF) (Report). Center for Science, Technology, and Engineering. p. 3. Retrieved 2011-12-01. 1 2 3 Royal Society (September 2009). Geoengineering the Climate: Science, Governance and Uncertainty (PDF) (Report). London, England. p. 1. ISBN 978-0-85403-773-5. Retrieved 2011-12-01. ↑ Climate Intervention: Reflecting Sunlight to Cool Earth | The National Academies Press. doi:10.17226/18988. ↑ "The Royal Society" (PDF). royalsociety.org. Retrieved 2015-11-02. ↑ Wigley, T. M. L. (Oct 2006). "A combined mitigation/geoengineering approach to climate stabilization". Science. 314 (5798): 452–454. Bibcode:2006Sci...314..452W. doi:10.1126/science.1131728. ISSN 0036-8075. PMID 16973840. 1 2 3 4 Lenton, T.M. ; Vaughan, N.E. (2009). "The radiative forcing potential of different climate geoengineering options". Atmospheric Chemistry and Physics. 9 (15): 5539–5561. doi:10.5194/acp-9-5539-2009. 1 2 3 "Geoengineering – Giving us time to act?". I Mech E. Retrieved 2011-03-12. 1 2 3 4 "Geoengineering the climate". The Royal Society. 2009. Retrieved 2009-09-02. ↑ Fearnside, P. (1999). "Forests and global warming mitigation in Brazil: opportunities in the Brazilian forest sector for responses to global warming under the "clean development mechanism"". Biomass and Bioenergy. 16 (3): 171–189. doi:10.1016/S0961-9534(98)00071-3. ↑ Boyd, P.W. ; et al. (2007). "Mesoscale Iron Enrichment Experiments 1993–2005: Synthesis and Future Directions". Science. 315 (5812): 612–617. Bibcode:2007Sci...315..612B. doi:10.1126/science.1131669. PMID 17272712. ↑ "WWF condemns iron fertilization scheme to fight global warming". News.mongabay.com. December 2012. Retrieved 2012-09-06. 1 2 Matthias Honegger; Axel Michaelowa; Sonja Butzengeiger-Geyer (2012). Climate Engineering – Avoiding Pandora's Box through Research and Governance. (PDF). FNI Climate Policy Perspectives. Fridtjof Nansen Institute (FNI), Perspectives. Retrieved 2013-05-05. ↑ Zahra Hirji (October 6, 2016). "Removing CO2 From the Air Only Hope for Fixing Climate Change, New Study Says; Without 'negative emissions' to help return atmospheric CO2 to 350 ppm, future generations could face costs that 'may become too heavy to bear,' paper says.". insideclimatenews.org. InsideClimate News. Retrieved October 7, 2016. ↑ "Geoengineering". International Risk Governance Council. 2009. Retrieved 2009-10-07. ↑ Reynolds, Jesse (2015-08-01). "A critical examination of the climate engineering moral hazard and risk compensation concern". The Anthropocene Review. 2 (2): 174–191. doi:10.1177/2053019614554304. ISSN 2053-0196. ↑ Morrow, David R. (2014-12-28). "Ethical aspects of the mitigation obstruction argument against climate engineering research". Philosophical Transactions of the Royal Society of London A: Mathematical, Physical and Engineering Sciences. 372 (2031): 20140062. Bibcode:2014RSPTA.37240062M. doi:10.1098/rsta.2014.0062. ISSN 1364-503X. PMID 25404676. 1 2 ) "Evaluation + Tools + Best Practices: How Do We Intelligently Discuss Politicized Geoengineering?". Worldchanging. Retrieved 2012-09-06. ↑ "The Royal Society" (PDF). royalsociety.org. Retrieved 2015-11-09. ↑ Bullis, Kevin. "U.S. Congress Considers Geoengineering". MIT Technology Review. Retrieved 26 December 2012. ↑ "Climate Intervention Reports » Climate Change at the National Academies of Sciences, Engineering, and Medicine". nas-sites.org. Retrieved 2015-11-02. ↑ "Stop emitting CO2 or geoengineering could be our only hope" (Press release). The Royal Society. 28 August 2009. Retrieved 14 June 2011. ↑ "Geo-engineering research" (PDF). Postnote. Parliamentary Office of Science and Technology. March 2009. Retrieved 2009-05-23. ↑ "Conference Home". Climateresponsefund.org. Retrieved 2012-09-06. ↑ Adam, David (1 September 2008). "Extreme and risky action the only way to tackle global warming, say scientists". Guardian Newspaper. London. Retrieved 2009-05-23. ↑ "Geo-engineering - 21st Century Challenges - Royal Geographical Society with IBG". 21st Century Challenges. 2010-09-30. Retrieved 2012-09-06. ↑ "IPCC Third Assessment Report - Climate Change 2001 - Complete online versions | UNEP/GRID-Arendal - Publications - Other". UNEP/GRID-Arendal. Retrieved 2012-09-06. ↑ "Photophoretic levitation of engineered aerosols for geoengineering". PNAS. Retrieved 2012-05-16. ↑ Bewick, R.; Sanchez, J. P.; McInnes, C. R. (2012). "Gravitationally bound geoengineering dust shade at the inner Lagrange point". Advances in Space Research. 50 (10): 1405–1410. Bibcode:2012AdSpR..50.1405B. doi:10.1016/j.asr.2012.07.008. ↑ Lenton, T. M.; Held, H.; Kriegler, E.; Hall, J. W.; Lucht, W.; Rahmstorf, S.; Schellnhuber, H. J. (2008). "Inaugural Article: Tipping elements in the Earth's climate system". Proceedings of the National Academy of Sciences. 105 (6): 1786–1793. Bibcode:2008PNAS..105.1786L. doi:10.1073/pnas.0705414105. ↑ "Stopping Runaway Climate Change". Energy Bulletin. Retrieved 2012-09-06. ↑ Kort, E. A.; Wofsy, S. C.; Daube, B. C.; Diao, M.; Elkins, J. W.; Gao, R. S.; Hintsa, E. J.; Hurst, D. F.; Jimenez, R.; Moore, F. L.; Spackman, J. R.; Zondlo, M. A. (2012). "Atmospheric observations of Arctic Ocean methane emissions up to 82° north". Nature Geoscience. 5 (5): 318–321. Bibcode:2012NatGe...5..318K. doi:10.1038/ngeo1452. ↑ Schuur, E. a. G.; McGuire, A. D.; Schädel, C.; Grosse, G.; Harden, J. W.; Hayes, D. J.; Hugelius, G.; Koven, C. D.; Kuhry, P. (2015-04-09). "Climate change and the permafrost carbon feedback". Nature. 520 (7546): 171–179. Bibcode:2015Natur.520..171S. doi:10.1038/nature14338. ISSN 0028-0836. ↑ "Tipping points in the Earth system". ResearchPages.net. 2005-10-06. Retrieved 2012-09-06. ↑ "We're Running the Risk of Unstoppable Climate Change". ↑ Arthur, Charles (2001-01-23). "Global warming now 'unstoppable', scientists warn". The Independent. London. Retrieved 2010-03-30. ↑ "Geoengineering could buy the time needed to develop a sustainable energy economy". Bulletin of the Atomic Scientists. Retrieved 2016-02-03. ↑ McClellan, J.; Keith, D. W.; Apt, J. (2012). "Cost analysis of stratospheric albedo modification delivery systems". Environmental Research Letters. 7 (3): 034019. doi:10.1088/1748-9326/7/3/034019. ↑ Robock, A.; Marquardt, A.; Kravitz, B.; Stenchikov, G. (2009). "Benefits, Risks, and costs of stratospheric geoengineering". Geophysical Research Letters. 36: D19703. Bibcode:2009GeoRL..3619703R. doi:10.1029/2009GL039209. ↑ "Unilateral Geoengineering" (PDF). CFR. Retrieved 2012-05-16. ↑ Bodansky, D (1996). "May we engineer the climate?". Climatic Change. 33: 309–321. ↑ Clingerman, F. and K. O'Brien, "Playing God: why religion belongs in the climate engineering debate,” Bulletin of the Atomic Scientists 70 (2014): 27-37. ↑ Clingerman, F. (2012) "Between Babel and Pelagius: Religion, Theology and Geoengineering," in Preston, C. (ed. ), Engineering the Climate: The Ethics of Solar Radiation Management. Lantham, MD: Lexington, pp. 201-219. ↑ Appell, David (2008-12-12). "Let's get real on the environment". The Guardian. London. Retrieved 2010-03-30. ↑ Caldeira, Ken (2007-10-24). "How to Cool the Globe". The New York Times. Retrieved 2010-03-30. ↑ Adam, David (2008-09-01). "Extreme and risky action the only way to tackle global warming, say scientists". The Guardian. London. Retrieved 2010-03-30. ↑ "Evaluation + Tools + Best Practices: Geoengineering and the New Climate Denialism". Worldchanging. Retrieved 2012-09-06. ↑ "AMS Policy Statement on Geoengineering the Climate System" (PDF). American Meteorological Society. Retrieved 2009-07-22. ↑ "Geo-engineering - A Tool in the Fight to Tackle Climate Change, or a Dangerous Distraction?". Huffington Post. Retrieved 2012-10-02. ↑ John Hickman (2013-12-28). "Rock, Paper, Scissors, Lizard, Spock… and Global Warming Policy Choice". The Space Review. Retrieved 2013-12-28. ↑ Can we engineer a cooler earth? ↑ Author. "Seasonal rhythms of net primary production and particulate organic carbon flux to depth describe the efficiency of biological pump in the global ocean". Journal of Geophysical Research. 112: C10011. Bibcode:2007JGRC..11210011L. doi:10.1029/2006JC003706. ↑ "Geo-Engineering – a Moral Hazard". celsias.com. 14 November 2007. Retrieved 9 September 2010. ↑ Royal Society (September 2009). Geoengineering the Climate: Science, Governance and Uncertainty (PDF) (Report). London, England. p. 4. ISBN 978-0-85403-773-5. Retrieved 2011-12-01. ↑ Mercer, A M; Keith, D W; Sharp, J D (2011-12-01). "Public understanding of solar radiation management - IOPscience". Environmental Research Letters. 6: 044006. doi:10.1088/1748-9326/6/4/044006. ↑ Kahan, Dan M.; Jenkins-Smith, Hank; Tarantola, Tor; Silva, Carol L.; Braman, Donald (2015-03-01). "Geoengineering and Climate Change Polarization Testing a Two-Channel Model of Science Communication". The ANNALS of the American Academy of Political and Social Science. 658 (1): 192–222. doi:10.1177/0002716214559002. ISSN 0002-7162. ↑ Integrated Assessment of Geoengineering Proposals (2014). Views about geoengineering: Key findings from public discussion groups. http://iagp.ac.uk/sites/default/files/Views%20about%20geoengineering%20IAGP.pdf. ↑ Wibeck, Victoria; Hansson, Anders; Anshelm, Jonas (2015-05-01). "Questioning the technological fix to climate change – Lay sense-making of geoengineering in Sweden". Energy Research & Social Science. 7: 23–30. doi:10.1016/j.erss.2015.03.001. ↑ Merk, Christine; Pönitzsch, Gert; Kniebes, Carola; Rehdanz, Katrin; Schmidt, Ulrich (2015-02-10). "Exploring public perceptions of stratospheric sulfate injection". Climatic Change. 130 (2): 299–312. doi:10.1007/s10584-014-1317-7. ISSN 0165-0009. ↑ Millard-Ball, A. (2011). "The Tuvalu Syndrome". Climatic Change. 110 (3–4): 1047–1066. doi:10.1007/s10584-011-0102-0. ↑ Urpelainen, Johannes (2012-02-10). "Geoengineering and global warming: a strategic perspective". International Environmental Agreements: Politics, Law and Economics. 12 (4): 375–389. doi:10.1007/s10784-012-9167-0. ISSN 1567-9764. ↑ Goeschl, Timo; Heyen, Daniel; Moreno-Cruz, Juan (2013-03-20). "The Intergenerational Transfer of Solar Radiation Management Capabilities and Atmospheric Carbon Stocks". Environmental and Resource Economics. 56 (1): 85–104. doi:10.1007/s10640-013-9647-x. ISSN 0924-6460. ↑ Moreno-Cruz, Juan B. (2015-08-01). "Mitigation and the geoengineering threat". Resource and Energy Economics. 41: 248–263. doi:10.1016/j.reseneeco.2015.06.001. ↑ Rayner, S.; Heyward, C.; Kruger, T.; Pidgeon, N.; Redgwell, C.; Savulescu, J. (2013). "The Oxford Principles". Climatic Change. 121: 499–512. doi:10.1007/s10584-012-0675-2. ↑ Oxford Geoengineering Programme. "Oxford Geoengineering Programme // History of the Oxford Principles". www.geoengineering.ox.ac.uk. Retrieved 2016-02-03. ↑ Council, National Research. Climate Intervention: Reflecting Sunlight to Cool Earth. doi:10.17226/18988. 1 2 "Home | The National Academies of Sciences, Engineering, and Medicine | National-Academies.org | Where the Nation Turns for Independent, Expert Advice". www8.nationalacademies.org. Retrieved 2015-11-24. ↑ "Climate Intervention Reports » Climate Change at the National Academies of Sciences, Engineering, and Medicine". nas-sites.org. Retrieved 2015-09-02. ↑ "Geoengineering Climate: Technical Evaluation and Discussion of Impacts". Royal Society (September 2009). Geoengineering the Climate: Science, Governance and Uncertainty (PDF) (Report). London, England. p. 1. ISBN 978-0-85403-773-5. Retrieved 2011-12-01. GAO (July 2011). Climate Engineering: Technical Status, Future Directions, and Potential Responses (PDF) (Report). Center for Science, Technology, and Engineering. Retrieved 2011-12-01. Launder, Brian; Thompson, J. Michael T., eds. (December 2009). Geo-Engineering Climate Change: Environmental Necessity or Pandora's Box?. Cambridge University Press. ISBN 978-0-521-19803-5. David Keith (2013). A Case for Climate Engineering. Eli Kintisch (2010). Hack the Planet: Science's Best Hope, or Worst Nightmare, for Averting Climate Catastrophe. ISBN 978-0-470-52426-8. Jeff Goodell (2010). How to Cool the Planet: Geoengineering and the Audacious Quest to Fix Earth's Climate. ISBN 978-0-618-99061-0. Oliver Morton (2015). The Planet Remade: How Geoengineering Could Change the World. James Rodger Fleming (September 15, 2010). Fixing the Sky: The Checkered History of Weather and Climate Control. Columbia University Press. ISBN 978-0-231-14412-4. Geoengineering links, GeoCrisis annotated list, 2006? A Debate on Geoengineering: Vandana Shiva vs. Gwynne Dyer – video report by Democracy Now!